LED headlights aren’t just cool looking blueish lights reserved for expensive luxury cars. They’re actually huge upgrades in terms of safety that do a much better job of illuminating the road ahead of you and even off to the sides. What you also might not realize is that any car can have LED headlights, not just pricey Porshces and BMWs. 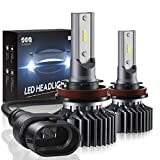 The Sealight LED Headlight Bulbs Conversion Kit comes in all sizes to fit any car, anyone can install it in less than 30 minutes, and it’s DOT approved. It’s somehow on sale right now for just $23.99 when you use the coupon code JD8DJD5P, so definitely get in on the action while you can. 【SMALLEST LED HEADLIGHT】H11 led headlight bulb,1:1 halogen’s design ,no more modification on headlight housing or cover. Perfect choice if you want to upgrade your headlights to LED type.